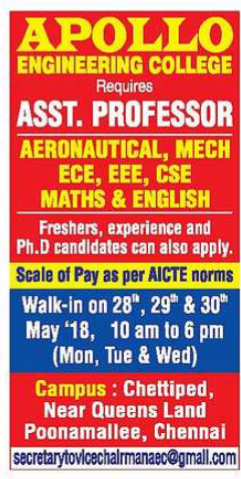 Apollo Engineering College, Chennai has advertised in HINDU newspaper for recruitment of Assistant Professor vacancies. Interested and eligible job aspirants are requested to walk-in on 28th,29th,30th May 2018.Check out further more details below. Name of the College : Apollo Engineering College, Chennai. 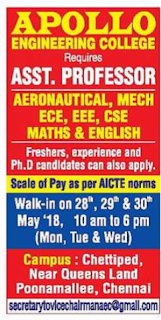 About College: Apollo Engineering College (AEC) is a private, self-financing, co-educational institution approved by the All India Council for Technical Education (AICTE) and is affiliated to the Anna University. AEC was established in 2007. This institution of excellence has a built up area of about 2,00,000 sq.feet and has been fully finished in style. Fresher, experienced, Ph.D holders can also apply.